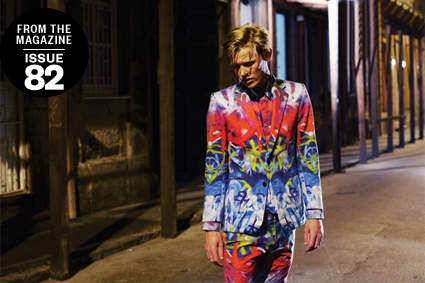 Matthew Miller prints a GPS map of London onto his fall collection. If you live in London, don’t be surprised if you recognize one of the graffiti scribbles or tree bark patterns that adorn Matthew Miller’s fall collection on your morning walk to the tube. Each print from his debut collection is a photograph of a specific spot in the city that’s been digitally transferred onto his garments. A native of Stoke-on-Trent, Miller was so enamored with his adopted home that, to find inspiration, he wandered the streets for up to seven hours every day, photographing what he saw. “I wanted to find the right surfaces that represented London,” he says. “Not necessarily always the most beautiful ones like the marbles and the granites, but also where the riots had happened, the graffiti.” His daily walks led him from the heart of London all the way out to its industrial and suburban perimeter. His favorite surfaces—eroding stone, a tree in Hyde Park and particle board covering a shop window during the 2011 riots—served as unexpected prints for his well-tailored two-button blazers, oxford shirts and backpacks, turning his fall collection into an expertly crafted, tactile Instagram feed. Miller also added a layer of play to the pieces, embedding a scavenger hunt by way of stitched QR codes that direct people to the exact location of each print. Scanning the labels with your phone brings up a four-screen navigational system that includes the original image, its geographical coordinates and a GIF of the location on Google Maps. “People want to consume information more instantly about where everything comes from,” he says. The irony is that the clothes are more permanent than the city; graffiti gets buffed out, particle board is removed, trees fall or get cut down, but a cotton jacket can now act as a semi-permanent record of something’s existence. “We walk past these things every day and don’t really notice,” Miller says. The same wandering spirit that inspired the collection has led him to contemplate leaving London for a little travel and maybe even a brief sojourn in Berlin. Hopefully he’ll take a camera and a sewing kit along for the ride. It was announced today that Miller is the recipient of a prestigious endorsement for emerging menswear talent called NEWGEN and sponsored by the British Fashion Council and Topman. For more information on the award and its other recipients, head to BFC’s web site.